Slewing ring, also known as slewing bearings or turntable bearing, is a large bearing which is able to sustain the more axial load, radial load and tilting moment. It is known as: “machine joints”, the essential machinery transmission parts, between the two objects that need to be relative rotary motion. It has the inner and outer ring, rolling and other components. One can consider the slewing drive as a gearbox because the core motion components are the slewing bearing and worm shaft. It also consists of auxiliary components such as seals, housing, and motor. As a power source, slew motor is usually DC planetary gear motor or AC gear motor. AC hydraulic motor is mainly used in the construction machinery as a power drive system. As the core component is slewing ring drive, slewing gearbox can readily withstand the axial and radial forces. 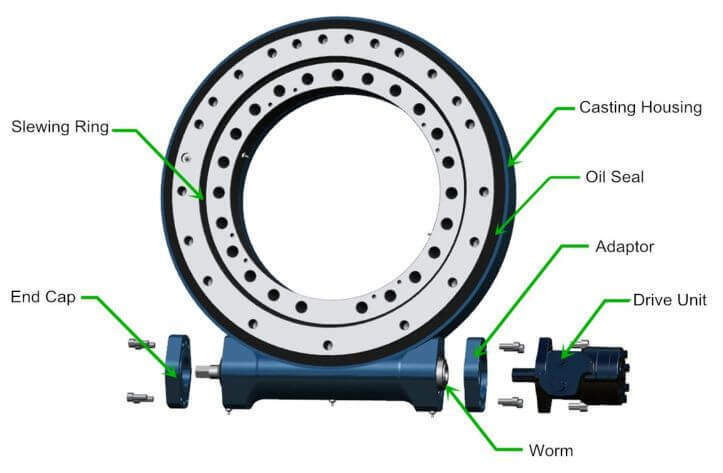 The slew drive working principle: The worm is driven by the motor, which drives the outer ring of the slewing ring to rotate; The outer ring output the torque through the flange and the inner ring of the slewing ring is fixed in the housing. Slewing drive has reverse self-locking because of worm gear drive with reverse self-locking characteristics. This feature greatly enhances the stability of the host operating and safety factor. Compared to the traditional swing products, slewing drive gearbox is easy to install, easy to maintain, and saves considerable installation space. Slewing drive is a perfect motion control product for the application which requires rotational torque strength.